North Atlanta Maternidad (Norcross) - Book Appointment Online! Northside Maternidad understands that this is an important time for you and your family. We want you to have what you need. We offer a friendly hand to pregnant women and their families. 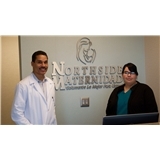 Northside Maternidad offers the finest maternity and family planning services utilizing the highest medical standards in America and the facilities of the best women’s hospitals in Atlanta. We love what we do and are committed to your care during this special time in the life of your family—the time of pregnancy and parenthood, regardless of income, insurance, citizenship, ethnic or national origin, or immigration status. Northside Maternidad treats its patients with care and respect at all times. Loved her, she was very nice and very professional. Everyone is very friendly and welcoming! Also , very time efficient office. Glad I decided to go with Dr. Freeman as my doctor!